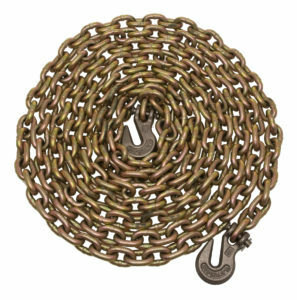 Binder Chains are manufactured using Grade 70 Transport Chain, Grade 43 High Test Chain and Alloy Chain. Chains are rated according to the grade of chain they are made from, and are used to bind down load prior transportation. Check with your state department of transportation or C.V.S.A for proper regulations on chain grades allowed to be used when securing loads when traveling on state highways. Load Binders are used to connect and tighten the chain after its been secured around the load. Lebus Load Binders come in several styles, but the most common two styles are the ratchet binder and the lever binder pictured below. To purchase, or for more information, please click here for a quick quote. Binder chains are highly flexible, impact resistant and can be used at higher temperatures compared to other synthetic options. Chain is also completely reparable, has minimal stretch, is extremely durable and corrosion resistant. 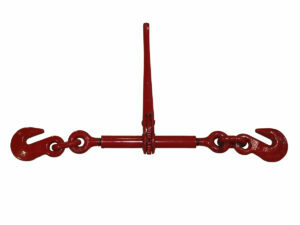 Binder chain assemblies are suitable for truckers, contractors, oil field and highway crews. 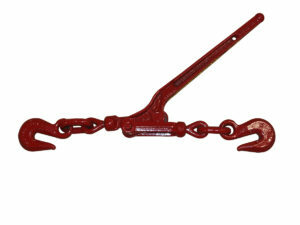 Grab hook at each end for load binding, hauling, towing and similar applications. WARNING: Failure to read, understand and follow the use and inspection instructions could result in severe personal injury or death. Binder chains should be inspected for bent links, excessive wear, stretched links, nicks and gouges or heat damage prior to use. Chain should never be knotted or twisted to shorten or lengthen. For training on chain inspection best practices, please contact our training department for classes. to make sure that all securement equipment and vehicle structures are in good working order and are used consistent with their capability. to perform periodic inspections during transit. to adjust cargo and load securement devices as necessary. and to ensure that cargo cannot shift on, or within, or fall from, the commercial motor vehicle. as necessary, add more securing devices.